I haven’t updated this site in a while for a few reasons. I have been pretty busy, doing a lot of different things. And, I have’t known what to say. It’s hard to write about my feelings, and we aren’t going on Casey adventures anymore. There have been many times I have come to write something but have opted not to. Everyday is still very challenging for me. I try to keep busy so that I don’t fall into a pit of despair, but everything catches up to me anytime that I stop. My heart is still in a million pieces and I do my best to keep it together, but I am still very broken. I recently went back to school full time. Going back to work in the tech industry didn’t feel right for me anymore. I really want to stay in the special needs community and with Casey’s friends and other kids like her. I have decided I want to work toward becoming a pediatric nurse practitioner and work with Palliative specializing in complex kids. It’s a LOT of work to get there though so I decided to dive in and get started. I should finish all of my non-nursing classes and pre-reqs this semester to officially appply (and hopefully get in to) the nursing program. The first step will be to get my BSN. This will get me the credentials to work in the hospitals or clinics. I plan/hope to work in the hospitals for about a year and then get into the masters program to get the next level- nurse practitioner. Shortly after Casey passed away we decided to continue all of the programs, events, etc that we started with and for her in her name. We created a nonprofit and named it Casey’s Circle. Keeping up with the nonprofit details, planning events, enhancing tools, building community relationships and all of the many different things needed to run a nonprofit keep Tim and I both pretty busy. The annual holiday party is coming up in about a month. It’s our biggest event, but something Casey always loved. It’s an emotional event for us to do without her, but it’s something we promised her we would keep doing for her. Tim is still working full time, but he helps a lot with Casey’s Circle stuff in his free time and he has created his own little side project that he does in his free time too- Timber Hearts. He got really good at woodworking (mostly to make stuff for Casey and me) and decided to start selling some of his stuff. He had his first booth at a local school festival a few weekends ago and it went really well. Then, if work, school, Casey’s Circle and Timber Hearts isn’t enough, we also decided to buy a farm/ranch. Some friends of ours bought a ranch about 2 years ago and we both really liked being able to get away from everything and spend time with them out in the middle of nowhere. Tim watched land sales for a long time, and then we kind of fell into a perfect place. It was not even listed. There is a 75 year old house on it that needs to be fully gutted and there are 2 really old (probably closer to 100 year old) barns that are pretty cool too (also, need a lot of work). The land needs a lot of work. There are lots of dead trees that need to be pulled, cactus over growth, fences that need to be replaced/removed/installed, and lots more. We needed a project. We needed something we could do together, something that would get us away from everything, and something that with a lot of work and time we could later use to help us continue to heal and grieve. A place where we could turn off the phones, and reconnect with Casey on a more spiritual level. We are still learning as we go. There is no right or wrong way to grieve, and we know that we will never stop grieving. We are trying really hard to keep moving forward though. The holidays coming up are really hard for us. Casey LOVED October-December. Casey would always get excited to dress up for Halloween and go see her doctors and nurses. This was our second Halloween without her and we still could not handle being home and answering the door for trick-or-treaters. Casey loved helping us hand out candy and treats each year. Last year we went to dinner and a movie and just stayed out all evening to avoid them. This year we decided to drive out to the farm and just hang out for a few hours. Thanksgiving was always Casey and my day. Tim would take my grandpa (or grandparents when they were both here) over to my sister’s house and Casey and I would have the day to ourselves. We would watch the parade together, snuggle on the couch, and just relax and enjoy time together. Tim would bring me a to-go plate when he came home, but Thanksgiving for me over the past years has been about a quiet day to reflect on things I’m thankful for (especially time with Casey). Last year Tim’s brother had just moved to Texas and his oldest daughter was turning 16 a few days after Thanksgiving. Tim’s mom flew in for the holiday and sweet 16 and his brother wanted us to come up to Dallas to join in. We told them we were not ready for holidays, but we would come the day after for the birthday party. The birthday got moved to Thanksgiving day and we ended up going. It was really hard for us. Christmas was even harder. This year my sister wants us to both come to her house for Thanksgiving. I really wish people understood why this is something we simply aren’t ready for, and may never be. Going back to spending the holidays the way we did before Casey feels like we are totally discounting that she was ever here. It just feels wrong to go back to the way things used to be. Doing things the same as we did with her is really hard too. How we can go through the same motions we did with her- without her now?! Nothing feels right. Last year we started going to a holiday support group and we were with other families that had lost a child. Some recent, some a while back. Holidays were still hard for those that were not new to this as well, and we all said the same thing. Nothing feels right and just going back to the way it was is not the answer. We need to find a new way to celebrate the holidays. Something that includes the family, but that doesn’t feel like what we did before Casey or with Casey. We need new traditions and to change things up. For this year, we just need time to grieve without the added guilt that we aren’t joining the family gatherings. It’s not personal. It’s not that we don’t want to be with family- we do want to spend time with family. We just aren’t ready for the holidays at all. Casey’s 11th birthday is coming up in just a few weeks. Last year we were still in fog from losing her just before she turned 10. She LOVED her birthday! Every year we would go all out. She loved to see her friends and have a day all about her. We would usually have a party on a weekend near her birthday, and if her actual birthday was on a weekday we would take her to her favorite place for lunch. Casey loved going to Chili’s. We would get her some ice cream; she couldn’t eat food by mouth, but she could taste things on her tongue. She loved to read the colorful Chili’s menu. We have a lot of special birthday memories of her at Chili’s. One year she wasn’t up to going physically so Tim went to Chili’s and got take out. He told them how much Casey loved it there and that she just wasn’t feeling up to coming that year. They gave him a menu to take home so that she could still read it while she was resting. One year she and her nurse made their own Chili’s menu full of all the Casey flair we love so much. We still have both of these menus with Casey’s books. Shortly after Casey passed away we created Casey’s Circle, a nonprofit, to serve as her legacy and to continue all of the work she inspired. To celebrate her 11th birthday we reached out to Chili’s. On Wednesday, April 19th, from open to close, Chili’s Round Rock will giving back to Casey’s Circle. You can dine-in or take-out at any time that day at the Round Rock location (2711 S Interstate 35, Round Rock, TX 78664). Be sure to tell them you are there for Casey’s Circle. You can download our flyer and hand it to them, or just mention that you are there for the Casey’s Circle Fundraiser. 10% of every purchase that mentions the fundraiser will be donated to Casey’s Circle. Help us celebrate Casey’s birthday this year at her favorite place. We hope to see you all there! This entry was posted in Casey, Special Needs Events. 1 year ago today we lost my grandpa, Lin. He always signed his cards and preferred to be called GP. GP and Casey had a very special bond. They loved each other so much and would jump at the chance to spend time together. Casey loved to go visit his at the assisted living center down the road and when he would come over he would always want to sit right next to Casey. GP and my grandma were amazing grandparents for me. By the time I had Casey they were starting to have some health issues. I always wished that Casey could have known them the way that I did, but I know that she knew them in her own way. I had taken GP to a doctor’s appointment, a routine appointment, just the day before. I knew he was having some issues breathing and hated to drag his oxygen with him, but over all he was doing pretty great for 92. When the nurse called that afternoon she didn’t want to say the words “your grandfather has passed away.” I could tell by the words that she did say that he was gone. I called for Tim to come sit with Casey and I got to GP’s minutes later. His room was full of EMTs, fire, police, etc. I knew he would not want to be kept alive on machines so I begged them to stop and to let him have peace. I was there for a few hours answering questions, filling out paperwork, and doing everything that needed to be done. Tim stayed home with Casey and started to call the family. I was not expecting GP to leave us when he did. I knew we didn’t have a lot of time left with him, but I was surprised when I got the call. I always knew when it was his time that he would go quick. I know he missed my grandma so much that his heart broke a little more each day. I hope that one day Tim and I will celebrate our 65th anniversary and still hold hands and love each other the way my grandparents did. I felt at peace knowing that the two were back together again. Surprised at how sudden it happened, but at peace that he went quick and that he was back with Grandma. Exactly one month later Casey left us. It was during her final days that everything made sense. GP would do anything for her, and I think he went ahead to be there to wait for her. Losing my baby girl is something I will never recover from, but I know that G&G are taking good care of her. I am sure she and GP are causing all kinds of trouble. I miss them all so much. One day I will be able to join them, but until my time comes I know she is in good hands. I have had many moments in my adult life where I have had to step away and take a moment. It just amazes me though how clueless some people really are. Let’s start 10 years ago. Tim and I were new parents and had a child with more medical issues that we had ever seen. We were learning how to use new equipment, all about the different types of specialists, diagnoses, treatments, etc. Every day was a struggle to keep our sweet little baby alive. Luckily social media was not what it is today- I really don’t think I could have tolerated social media at that time in my life. I would get so angry at friends and family that would complain about things I would have given anything to deal with. Maybe they were complaining that their child failed the driving test, or that little Johnny was almost 3 and they just can’t get him potty trained. Or maybe I would hear someone asking for prayers because they just could not get over a cold and they had a big meeting coming up at work. UGH!!!! Things things don’t matter! I would love to have a big work meeting coming up that I may miss due to a cold- but instead my concerns are over how to keep my child alive. It took a while, but I eventually learned that people that do not have children with special needs have very different concerns than those of us that do. They don’t know what my life is like and their concerns were not intended to anger me. I eventually realized I was glad they did not know what my life was like. I don’t want other children to have to go through what mine is going through and if they were completely clueless to my concerns then maybe that was a good thing. Around Casey’s second birthday I finally met other parents of children with special needs. This was a whole new world for me, I could talk about my fears and concerns and these other moms really understood what I meant. It was great, for a little while. Some of the moms have children with very complex needs and I felt like they did understand. However, there were other moms whose children had the label of special needs, but the child was very minimally impaired. I didn’t understand how a mom with ADHD could come into a group with moms like me and complain about her life. Again, her concerns sounded like a walk in the park and something I would have loved. I took a step back and realized that in the special needs world things are very subjective. What may seem like the end of the world to one family is a breeze to another. However, we all have very similar emotion struggles. We all have a child dealing with something that we can’t simply fix. It’s not a broken bone that will heal, it’s not a cold that will be gone in a few days, we are all dealing with ongoing issues and we can’t fix it. I had to work really hard to appreciate that while their specific challenges (equipment, diagnosis, doctors, etc) may be very different they were hurting as a parent in a way very much like me. Then came social media. I was so happy to see all of the different ways that the special needs community connected through social media. There were groups by location, diagnosis, general special needs, for school issues, for insurance, over time there has been a page or group for just about anything you can image. I would go to some of the diagnosis specific groups and get very angry. Casey’s diagnosis has varied effect. Some children or very complex and similar to Casey, but on the other end some children have very few issues at all and will be able to live very full and independent lives. When those families would complain I would lose my mind. Do they not know how lucky they are that their child is doing so well?! Then I would have friends (from the special needs community and from other areas of my life) in my news feed. Seeing people post happy celebrations was great. I am honestly happy for them. Seeing people complain about things that simple don’t matter was getting to me again, just like it had early on with Casey. I had to learn to let things go, I left groups that I felt were causing me more anger than support. I removed some people from my news feed so that we were still friends, but I wouldn’t see their daily rants on topics that I felt were a waste of time and energy. After a while I was able to log on and not get angry. Over the last year I have had to step back again many times. After we lost Casey in March I have had very little patience for people complaining about petty things. I want to scream at them and tell them that they have no idea what really matters in this world and that they need to be thankful for what they have. Quit complaining! Your family is healthy, you have a roof over your head and food on your table, life is good! Without fail though, people have no idea how silly they sound when they act as if the world is ending because someone messed up their order at McDonalds and the kids cried because they got fruit instead of fries with their happy meals. No, I will not boycott McDonalds with you over this, nor will I share your post and ask my friends to never go there. IT DOESN’T MATTER! I had to learn to step away again and take a moment. I’m glad that these moms have children that can cry when they get the wrong order. I’m glad that these moms don’t know the pain that I carry with me every day. I wish that no parent ever had to lose their child. For that reason I am able to be happy that these people annoy me so much and make me want to scream at them. It’s still very hard to keep my composure though when I know what really matters in life and how fortunate these people really are. I guess my perspective has changed a lot over the years. Casey has taught me to be thankful for everything and she has taught me what really matters in life. I like to think that if she had been healthy and my life had been different that maybe, just maybe, I wouldn’t be one of these clueless moms that drive me crazy. I hope that I would be one of the more compassionate and caring people. If you have a friend or family member with a child that has special needs, or one that has lost a child. Try to keep that in mind. You don’t have to edit everything you say, but try to appreciate what you do have. We all have bad days, and we are all going to complain about things from time to time. Take a minute and realize what matters most to you. At the end of the day if what matters most is still there, it’s not that bad. This entry was posted in General Special Needs. Over the years we have shared posts that talk about some of the stress that came with the holidays. There were food centered holidays and we had to find ways to modify these so that Casey could participate. Then there was the issue of over stimulating Casey. When we would have a house full of family (and kids) it could get a lot louder than she was used to. She could usually handle this for a little while, but if it went on more than a few hours she would start to really struggle and her physical health was impacted. Usually over holidays Casey’s nurses would take time off. We always understood this; they all had families of their own. However, when they would take off that meant we had to stay up all night, or Tim would have to take off work, or a variety of other things that we would have to do to be able to still keep Casey’s care managed. Trying to manage all of Casey’s needs and then adding preparing family meals, getting the house ready for guests, etc. would often be stressful for all of us. However, we gladly added this stress because being able to bring the holidays to Casey in her home was the best way that she could be part of the celebrations. Our families and friends were always really good about understanding how doing things in her home made things easier for her (and for us). This holiday season feels more stressful than any we have celebrated over the past. Casey loved Halloween and Christmas. The thought of celebrating these without her is very painful. A week before Halloween we went to a special needs Trunk or Treat and handed out goodies to other kids like Casey. We did this as part of the nonprofit we created to continue all of the work that Casey started. We had to kind of emotionally check out to get through this. We were there as a work event, but every fairy or wheelchair costume that we saw broke our hearts a little more. We were glad that we did it, but it was really hard. That wasn’t even on Halloween so when Halloween came around we felt completely lost. We opted to put a bowl of candy on the front porch with a sign to take one, then we went to dinner and killed as much time as we could before heading back home. Casey always loved handing out treats with us, or on days she was up for it, going trick or treating. On Halloween we always took treats to all of her doctors as well. We didn’t do that this year. We couldn’t. Part of us wanted to go see all of her doctors and to thank them again for all that they gave her and us over the years, but it was just too hard. The palliative team is hosting a workshop/therapy group for families that have lost a child. We started last week and will go weekly through November. The focus of the group is to help us survive the holiday. There were other families in the group with us. Some of them have already been through multiply holidays and they still do not feel equipped or emotionally able to get through them. Hearing them talk about some of the things they have tried in years past made us feel a little less crazy, but knowing that they have been years in the trenches and still struggling makes our fears of the future even more real. All Tim and I want to do is close and lock the doors and just be alone with Casey. We aren’t ready for big family celebrations. Before we had Casey we used to split the holidays. We would do Thanksgiving with one family and Christmas with the other. We tried to switch it back and forth each year traveling from Los Angeles to either Chicago or Austin. After Casey was born, travels stopped. Any celebration was done at home so that she could participate. The thought of traveling for a holiday and celebrating with family now makes me really sad. I feel like it is almost just going back to the way it was before and it almost negates her life all together. I know it doesn’t, but that’s how it feels. The thought of having the holidays at our home like we always did with her is too painful as well. How can we just do the same thing without her? I think eventually we will get there and we may be able to celebrate holidays in some capacity, but it’s going to take time. I have no idea how much time, but I know we need time to mourn and to heal in our own ways. We know that the rest of our family is sad and misses her as well. We know that they want us to join them in the holidays. It’s different for us though. She was our entire world- our baby girl. It is just too painful. With Thanksgiving and Christmas right around the corner Tim and I both find ourselves feeling a litmus of emotions. We are still devastated that our princess is not here each and every second of every day. We find ourselves picking up toys and clothes we see that make us think of her and want to put in her stocking or under the tree. Then we have to remind ourselves that she won’t be able to open her gifts this year. We find ourselves feeling guilty when we leave the house and don’t have to have a nurse and a backup in the ready for us to leave together. All the while we feel so fortunate that we were able to be her parents and that we had 10 amazing years with her. We feel proud of all that she was and all that she did. We go through all of these emotions a million times a day. With the holidays sneaking up on us the emotional roller coaster is only growing. I have no idea what we will find our selves doing over the holidays, regardless it’s going to be very difficult for us. Most likely I think we will use the time for quiet reflection and to continue to mourn and to heal. We’re not quite ready for big holiday celebrations just yet. We appreciate everyone inviting us to join them in holiday celebrations. We can’t do it this year, and it may be many years before we can, but we appreciate the invites. Please don’t take our declining as us not wanting to be there. We want to be able to celebrate with you all, we really do. Keep inviting us, and eventually we will accept. Please understand when we decline though, and please don’t pressure us to jump before we are ready. Exactly one month before Casey passed away, we also lost my grandfather. He loved Casey so much and I know they are together now with my grandmother as well. That brings me some comfort. This is the first holiday without him as well. 2016 has been such a hard year (for so many people, not just us). I am ready for 2017. I wish I could just time warp ahead and skip over the holidays this year all together. We’re are doing the best that we can. We will find our way eventually. I love getting signs from Casey. I don’t get them everyday, and sometimes I seem to get more than others, but I love the little messages she sends me to let me know she is okay. I always knew I would be here without her one day, and I did my best to make the most of the days we had while still preparing for our inevitable future. There were 2 things I always hoped for. First was that when she was ready and let me know, that I would not miss her signal or misinterpret it for selfish reasons. Second was that she would find a way to let me know she was okay and not suffering. I asked Tim the other day if he gets little signs and he said not as often. I wish she could find a way to let him know she is okay too, but I am so thankful for the signs she sends me. A few days ago I was missing her a lot (that is every moment of every day really). One way I feel connected to her is to just float around in the pool. I was sitting in her chaise drying off after. She always loved to lay in the sun on those chairs. When I looked up into the sky there were perfect white fluffy clouds scattered across. Right in the middle, the clouds made a big “C”. I smiled and thought of her doing all of her arts & crafts and how much she loved her name and the letter “C”. Then I glanced back and the “C” had dissolved into a heart shaped cloud. I knew she did that; she knew I was missing her a lot right then. I see little things like this often and they help get me through the day. Some of Casey’s nurses, teachers and friends have told me they get little signs from Casey too. She is a busy girl up there. I treasure these signs. One of these days I will find a way to schedule a one-on-one appointment with the Long Island Medium and actually talk to Casey too. Tim and I have been working hard to get Casey’s Circle going. We got our official non-profit status pretty quickly and have since been trying to lock in the events we want to do, some fundraising ideas, and ideas for online education to help kids like Casey as well. We have made some progress and it has been good to have a way to keep doing the work Casey started. It has been hard for me to get back into writing, but I am working on it and have some ideas. We are working on confirming the dates for all of our holiday events now. Hopefully I will post a save-the-date with more details soon. As everyone that knows Casey knows, she was a HUGE ‘My Little Pony Friendship is Magic’ fan (MLP). She may have even been the number 1 fan. 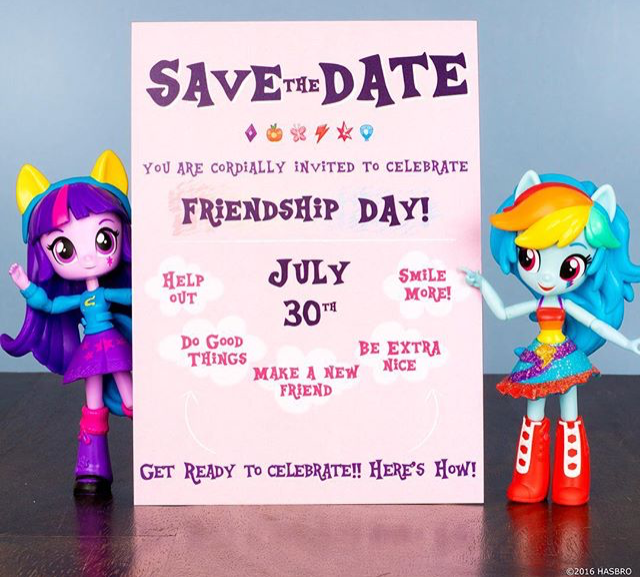 MLP has a special event happening tomorrow, July 30th. It is Friendship day! There are a few things that MLP suggest people do to help celebrate. We LOVE this idea and think Casey would too. In order to help promote friendship and being good to one another we are offering a tshirt giveaway. MLP contacted us and threw in some MLP toys to go with the giveaway too! In order to enter share a picture of your child and his/her friend, or a picture doing one of the things MLP suggest in the image below. You can either post your pictures directly on Casey’s Circle Facebook Wall, or you can send us a picture by email – info@caseyscircle.org. Be sure to add #FrienditForward! Enter by 11:59PM 7/30 CST for a chance to win. Good luck, and happy Friendship Day!!! This entry was posted in Casey, General Special Needs, Special Needs Events. Casey’s Circle T-Shirts are available for a limited time! The shop is open, and you can order your shirts anytime between now and 7/31 11:59PM CST. All order will be sent to the printer first thing on 8/1. If you are one of the many people asking where they can get one, now is your chance.